I’ve been stealing my mom’s clothes and accessories probably since I was 11. Well, I guess I shouldn’t call it stealing because unlike most moms, mine actually liked when I, along with my two older sisters, raided her closet. She still does—even with the recent addition of my adolescent niece (her granddaughter), Maddy. Of course, that’s as long as we stay away from any new purchases and stick to the vintage stuff, but still, surprising, no? While it’s true that maybe it’s because she’s not just a regular mom, she’s a cool mom, it goes beyond that. As someone who loves (and always has loved) fashion just about as much as I do—and you guys should know how much I do—she has collected so much over time that it’s rewarding to see purchases from 10, 20, and even 30 years ago still stand as not just wearable, but stylish, today. With that in mind, I thought there would be no better person to get advice from about which fashion items are the best investments and most likely to stand the test of time. To read what she had to say, and of course, shop my picks for each one, just keep scrolling. If the animal-print resurgence of seasons' past taught us anything, it's that the trend always comes back. My mom, however, takes things one step further in claiming that leopard is the most classic of the bunch. I'm going to have to agree with her on that one. My mom bought her first Chanel bag 30 years ago, for roughly one-quarter of the price it would be sold for today. She still has it and wears it, along with several other classic bags she’s invested in over the years. As someone who’s relatively new to the blazer game herself, I can totally relate to this one. After investing in a couple good blazers over the last year, I’ve become obsessed and don’t see this slowing down anytime (or decade) soon. My mom has had an ever-growing drawer of silk scarves for as long as I can remember (and definitely longer than I can remember). But, if you went through them all trying to guess which ones were new and which older, you’d never know. Whether on a bag or around her neck, she uses them so often it’s no surprise they made the cut. Remember that time I said this, too?! Like mother, like daughter. 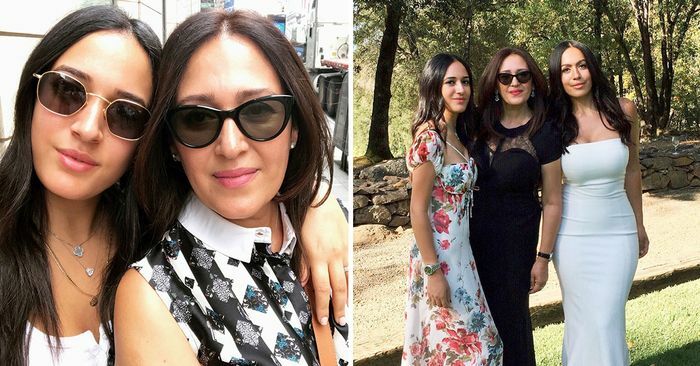 Since a major part of our Iranian culture includes lots and lots of celebrations, my mom has seen many a cocktail dress and gown come and go (for both herself and her daughters) over the years. However, the ones that stay in rotation the longest are always black and relatively timeless in silhouette. Plus, she mentioned, dark colors hold up better over time, while whites can yellow and lighter shades can discolor. I knew this would make the list before I even asked my mom because I’ve actually already “inherited” quite a few of her Manolos over the years. From both fun, colorful pairs to simple black styles, this is one shoe brand that truly seems to stand the test of time. If this sounds a little vague to you—don’t worry, I followed up. In this category, she actually includes real solid-gold pieces as well as costume jewelry. Both, she says, always come back in style and are worth the investment because jewelry is one thing you always know is going to get more expensive to buy later—at least, that's been the track record so far. Up next? The only spring trends you need to know about.